BGG: "Anyone telling you the political climate isn’t important simply isn’t paying attention"
Article: "Iraq: 20 Lawmakers to Be Arrested as Parliament Term Ends" I’m a little curious to see if there is any specific sectarian break-down on this round of prosecutions. Not that it really makes a direct impact on the overall investment – I’m just curious. It also looks like, to me, the political climate is getting better and better. Progress. Anyone telling you the political climate isn’t important simply isn’t paying attention. The things we are seeing unfold right now are pretty good for the overall welfare of this investment and Iraq in general. Re: BGG: "Anyone telling you the political climate isn’t important simply isn’t paying attention"
Which do you think is more important the political climate or this? Iraq has been decimated, they are borrowing money as fast as they can to try and begin to rebuild, a process that is likely to take decades. 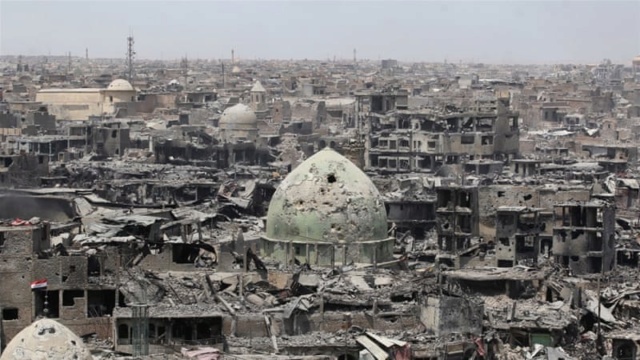 Estimates are it will take up to 10 years just to make the streets safe to begin the rebuilding due to all the munitions and IEDs in the rubble. Meanwhile the stench of death penetrates much of the formerly ISIS held areas. Do you really think the political climate is the overriding factor? If you do, I have a bridge in Manhattan that's on the market ... prime income making opportunity.